Snowy Village is first and foremost a Korean bingsoo (ice dessert) restaurant, they specialized in shaved ice desserts (and boy do they do it well!). 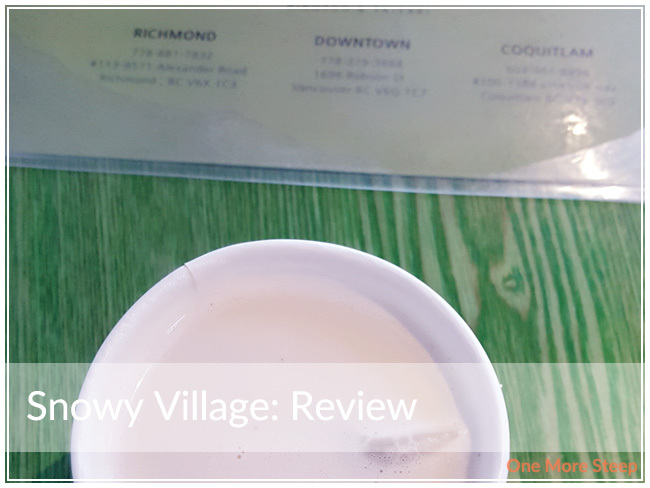 Snowy Village also serves hot tea and coffee (as well as iced), hence the reason for this review. 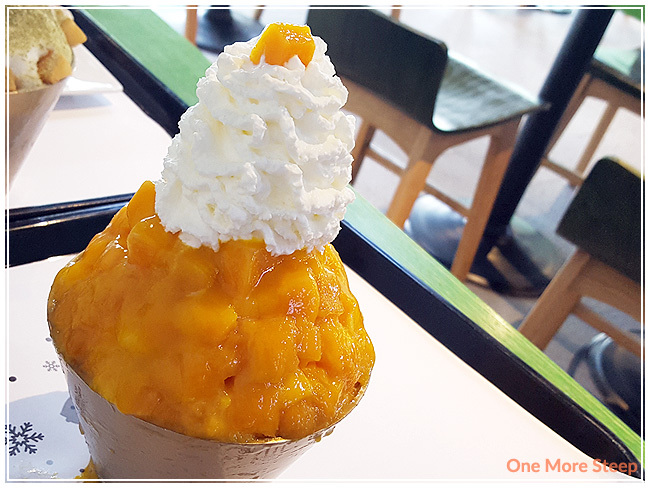 For those curious, I got a mango bingsoo in the regular size. Most of the shaved ice desserts are available in regular or large sizes. I felt like the regular size was pretty sizeable (and delicious). Instead of using shaved ice water, they use shaved iced milk. A lot more creamier (and delicious) compared to the other shaved iced desserts I’ve had in the past. My regular sized mango bingsoo was $10. My drink was a London Fog. Curiously enough, the Snowy Village website states that they make London Fogs but the menus in store did not have London Fog listed. When I ordered, I did get a bit of a blank stare when I asked for a London Fog. I clarified by saying that it was an Earl Grey latte and suddenly a light went off and the person helping me knew what it was. The price of the London Fog was $3.00, which was the same price as the price of a Cafe Latte on the menu. 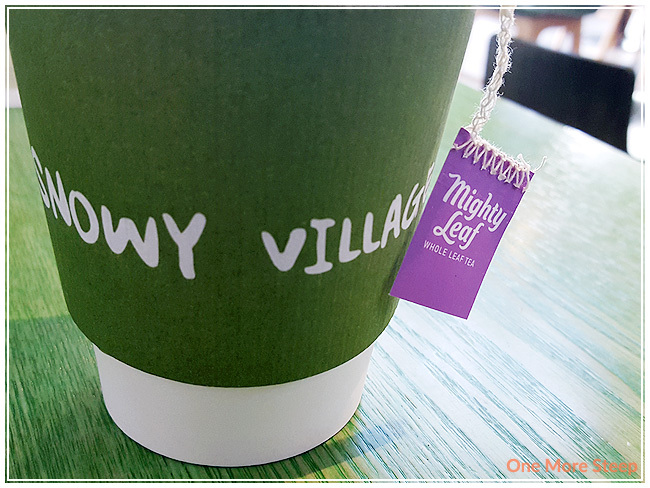 I asked and was told that they exclusively use Mighty Leaf Tea, which is a Canadian tea company. My London Fog came with a thin layer of foam on top, but the tea was steeped well. You can see how thin the foam was in the first photo. I forgot to pull out the tea bag after a few minutes of it arriving, but found that the tea itself didn’t get bitter (which was nice!). I do like a good tea that doesn’t get overly bitter if I forget to remove the tea bag when I’m on the go, although I’d have to do some experiments to see if it’s still the case if the tea is steeped straight without the addition of milk. Overall, I had a lovely experience at Snowy Village. The price of the London Fog was quite comparable to other places that I’ve been (and it’s generously on the lower end). I do wish that there had been more foam on top, but the place wasn’t primarily a tea and coffee cafe – it’s an iced dessert cafe. I would go back from the bingsoo, but probably not for the London Fog (I like a bit more foam with my tea lattes! ).